Park City, Alta, Brighton, Deer Valley and the other resorts spend time and energy creating and maintaining hiking paths through the nearby national forests, letting visitors appreciate this beautiful setting in the summer. You will not be disappointed when you visit Snowbird, a top ski resort with luxury accommodations and yearlong activities. By offering recreational programs at local parks, including fitness classes and youth sports, Basin Recreation welcomes residents and vacationers. The trail runs 28 miles from Park City to Echo Reservoir, and is open to hiking, biking, and horseback riding. The Silver Lake Trail at Brighton is a great one-mile trail that's wheelchair accessible. The Willow Heights is perfect moderate hike if the group has two hours to spare. 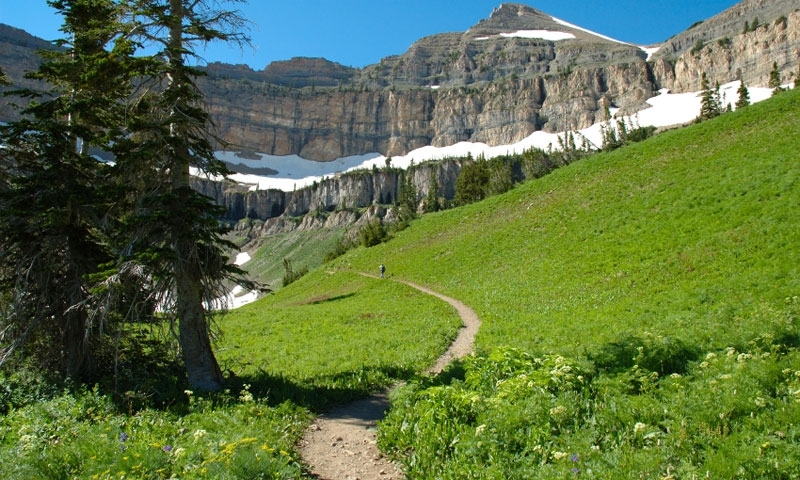 Summiting Mount Timpanogos is a long, but manageable hike to 11,749 feet. The Mid-Mountain Trail connects Deer Valley, Park City and The Canyons at 8,000 feet elevation. Between the developments of the National Forests and mountain resorts like Deer Valley, The Canyons and Park City, hikes are found cutting into and out of the most scenic areas around. If you simply look at a mountain or forest in the hills, it's likely there are multiple Park City hiking trails that lead there. Part of the cross-country trail system in winter, this is a quiet boardwalk trail, perfect for small children and fully accessible to wheelchairs. There are benches and interpretive signs to help visitors appreciate and learn about the natural systems found here. Trailhead: To find Brighton from Park City or Deer Valley, continue to head up UT-224/Marsac Ave. This road is closed in the winter, but is scenic (and steep) in the summer. Continue to head up after the junction with UT-152 to Brighton, where the trailhead is well marked. Notes: There is a 1.5-mile spur hike to Lake Solitude that branches off the Silver Lake Loop for those looking for more exercise. Not to be confused with the other Silver Lakes in the area, Deer Valley's Silver Lake Trail is an excellent hike to get out onto the mountain during summer. The hike summits the 9,400-ft. Bald Mountain, with far-reaching views of Park City, Weber Valley, Mount Timpanogos and more. Trailhead: The trail starts at Silver Lake Village in Deer Valley. Take UT-224 to Royal Street West and park in the resort parking lot. Difficulty: Ascent is strenuous, but the descent is moderate. Notes: If members of the group are struggling with the altitude, take the Sterling Express Lift up and hike down. For a little more exercise, the Tour des Homes Trail is an excellent connector trail from Snow Park Lodge, passing by the "rustic" mansions under Silver Lake Express Lift. This is a great hike if you have a couple hours to spare. The scenery is nice during any time of the year, whether it's the spring flowers, the summer grasses, or the fall colors (or winter snow). The trail starts in aspen groves, then quickly gains elevation before coming out to the small alpine lake. Trailhead: The trailhead is 2.4 miles west of Brighton, designated by a large stone marker on the ground. To get to Brighton from Park City in the summer, head up UT-224/Marsac Ave., continuing up and over the pass after turning onto UT-152. Get a lift up to the starting point in the Flight of the Canyons Gondola, putting you right at 8,000 feet and ready to start exploring the area. The trail leads to a great lookout point, but there are also variations of different difficulties and lengths. Trailhead: The Canyons is located about 4 miles north of Park City along 224. Follow the signs along Canyons Resort Drive to the parking lot. Notes: There are many options from the top of the gondola, so be sure to view some of the other trails as well before heading back down. Cresting the ridge between Big Cottonwood Canyon and Little Cottonwood Canyon, this trail connects Alta and Brighton ski resorts. The views of the twin lakes at the pass are great, as is the chance to pass through Old Michigan City, an abandoned mining town near Alta. Trailhead; The Alta trailhead is located in the center of town on the north side of Little Cottonwood Road, across from the Alta Lodge. The Brighton trailhead is located at Silver Lake, where there is plenty of parking. Notes: Be cautious when exploring this route. Do not enter the mines. Also, moose frequent this area. While they may appear tame and docile, but they are unpredictable and dangerous, so maintain distance, especially of mothers and their calves. As the second highest peak in the Wasatch Range at 11,749 feet, Mt. Timpanogos is a popular hike because of its steep rise off the valley floor as well as the beautiful scenery along the way. The hike is long, but it isn't difficult, so take your time and soon you'll see the summit. Trailhead: From Park City, the easiest way to reach the trailhead is by heading south on US-40, then splitting onto UT-189 after Heber. After 15 miles, turn onto UT-92 and head up 7 miles, past Sundance Resort and the fee booth. The parking lot is on the left, also used for Aspen Grove Trail. Notes: There are plenty of water stops to replenish supplies along the way, but bring a filter to purify the water. Formerly known as the "Eight Thousand Foot Trail," this trail winds from Deer Valley Resort, through Park City Resort, and ends at The Canyons Resort, all at about the same elevation. Lift service makes wandering the trail easier, as there is an option to avoid the ups and downs, but still enjoy the high altitude views. Trailhead: Deer Valley's Silver Lake Lodge, The Canyon's lower parking lot and Park City Resort all serve as access points to the trail. Elevation Gain: 1,400 feet vertical gain over the entire course. Notes: As with all Park City, Utah hiking trails that are mixed use, be sure to share with the other bikers and hikers. Summiting the highest peak in Utah at 13,528 feet is not everyone's cup of tea, but for those who enjoy getting out into the high country and testing their meddle against the elements. Trailhead: The most commonly used route is from Henry's Fork Trailhead. Starting from Mountain View, Wyoming off I-80, take UT-414 south to UT-410 south. Drive past Robertson onto Forest Road 072. This leads to Forest Road 017, which connects to Forest Road 077, leading into the Henry's Fork Trailhead. Notes: There is a good deal of boulder scrambling near the summit, so come prepared with ankle-supporting shoes and walking poles. To complete the entire hike is huge, but consider the High Line Trail as a base, with countless variations to customize for your group. Traversing the entire High Uintas Wilderness Area from east to west, the High Line Trail is almost entirely above the timberline, set in the high alpine world above 10,000 feet. Trailhead: While the complete route runs from High Line Trailhead on UT-150 to Hacking Lake Trailhead outside Vernal, Utah, there are many points in between to access the trail. Notes: Rather than tackling this entire trail in one trip, most hikers break up the hike into multiple sections. Doing one- and two-night segments makes the trip easier to manage. Shorter loops and one-ways using the trail as a base are popular variations. The American Hiking Society has many affiliate clubs that offer hikes and hiking events. Weber Pathways is an organization dedicated to using hiking, biking, and human powered snow trails.